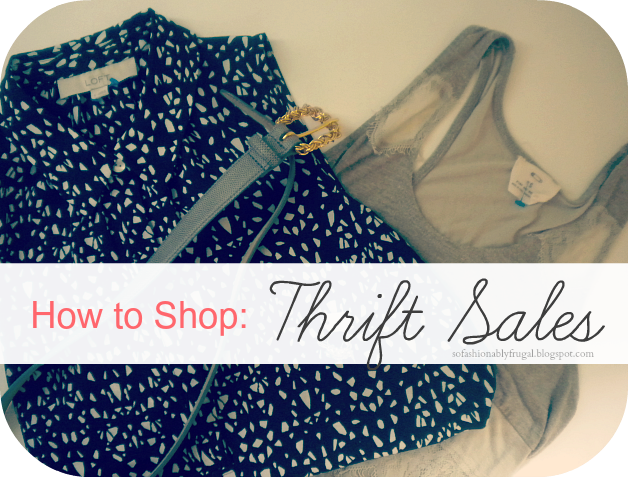 So Fashionably Frugal: How to Shop Thrift Sales! 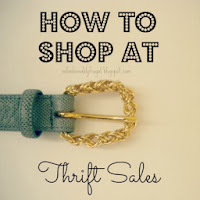 Where I live, October arrives with thrift, yard, and rummage sales galore. I swear I've been raised around them. Trying to find great deals to use my allowance on as a kid. I think it's paid off! Lately, I've found a lot of bargains at these sales. The picture above includes some great deals I found this week! Including a practically new Loft blouse! I'm not going to lie. With these kind of sales comes a lot of junk. It can get pretty messy and time consuming. But never forget!! Someone's trash is another one's treasure! If you have the patience, you too can find great bargains! Here's how! 1) Be Early - If you really want a deal, it's good to get there before the crowds come. The early bird does get the worm after all. 2) Look Through Everything - Often the bargain buys are hidden where shoppers don't tend to look. Not on purpose of course! I find that a good amount of people don't have the patience to search to the bottom of a bin or look under piles of items. But patience is key at these sales if you want to find something great. 3) Question the Price - Before you even let yourself see the price...think to yourself, "What price would I pay for this?" Then check the tag. If the price is nowhere near what you'd pay, forget it. It's not a deal and you know it. 5) Will I use it? - Avoid the impulse buys. It's never a deal if it's going to sit in your closet and collect dust. Think about how many times you will honestly use it. If it's more than once, you are good to go! What's been your best find at a thrift sale? Share below!